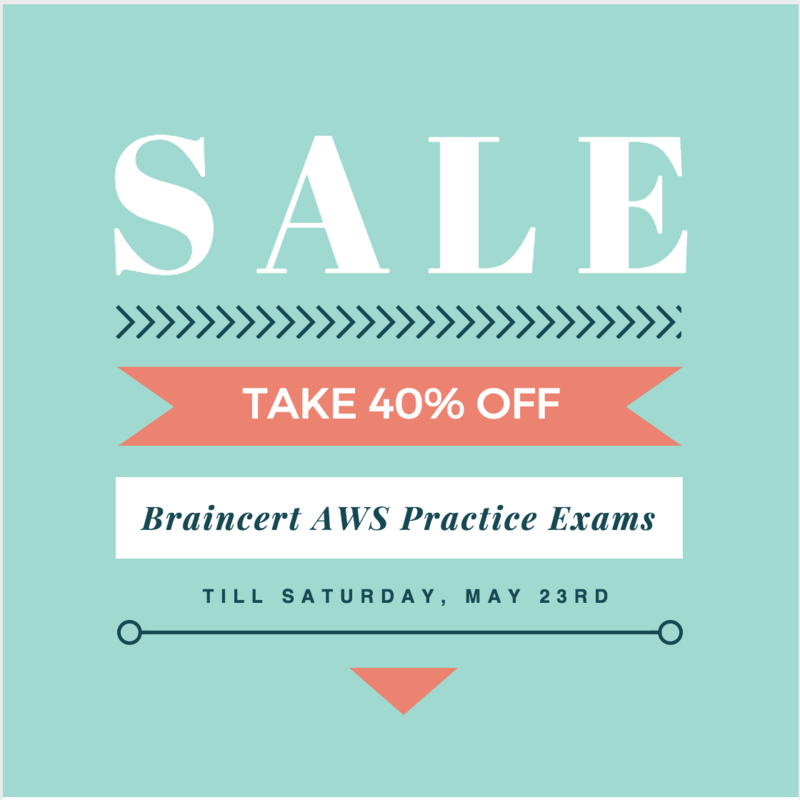 Amazon Web Services provides services and infrastructure to build reliable, fault-tolerant, and highly available systems in the cloud. Fault-tolerance defines the ability for a system to remain in operation even if some of the components used to build the system fail. Most of the higher-level services, such as S3, SimpleDB, SQS, and ELB, have been built with fault tolerance and high availability in mind. Services that provide basic infrastructure, such as EC2 and EBS, provide specific features, such as availability zones, elastic IP addresses, and snapshots, that a fault-tolerant and highly available system must take advantage of and use correctly. Amazon Web Services are available in geographic Regions and with multiple Availability zones (AZs) within a region, which provide easy access to redundant deployment locations. AZs are distinct geographical locations that are engineered to be insulated from failures in other AZs. Regions and AZs help achieve greater fault tolerance by distributing the application geographically and help build multi-site solution. It is important to run independent application stacks in more than one AZ, either in the same region or in another region, so that if one zone fails, the application in the other zone can continue to run. EC2 is a web service within Amazon Web Services that provides computing resources. Amazon Machine Image (AMI) provides a Template that can be used to define the service instances. AMI can either contain all the softwares, applications and the code bundled or can be configured to have a bootstrap script to install the same on startup. Auto Scaling helps to automatically scale EC2 capacity up or down based on defined rules. Auto Scaling also enables addition of more instances in response to an increasing load; and when those instances are no longer needed, they will be automatically terminated. Auto Scaling enables terminating server instances at will, knowing that replacement instances will be automatically launched. Elastic Load Balancing detects unhealthy instances within its pool of EC2 instances and automatically reroutes traffic to healthy instances, until the unhealthy instances have been restored seamlessly using Auto Scaling. Auto Scaling and Elastic Load Balancing are an ideal combination – while ELB gives a single DNS name for addressing, Auto Scaling ensures there is always the right number of healthy EC2 instances to accept requests. ELB can be used to balance across instances in multiple AZs of a region. Elastic IP addresses are public static IP addresses that can be mapped programmatically between instances within a region. EIPs associated with the AWS account and not with a specific instance or lifetime of an instance. Elastic IP addresses can be used to work around host or availability zone failures by quickly remapping the address to another running instance or a replacement instance that was just started. Reserved instances help reserve and guarantee computing capacity is available at a lower cost always. Elastic Block Store (EBS) offers persistent off-instance storage volumes that persists independently from the life of an instance and are about an order of magnitude more durable than on-instance storage. EBS volumes store data redundantly and are automatically replicated within a single availability zone. Valuable data should never be stored only on instance (ephemeral) storage without proper backups, replication, or the ability to re-create the data. EBS volumes are highly reliable, but to further mitigate the possibility of a failure and increase durability, point-in-time Snapshots can be created to store data on volumes in S3, which is then replicated to multiple AZs. Snapshots provide an effective way to deal with disk failures or other host-level issues, as well as with problems affecting an AZ. In case of a failover scenario, the standby is promoted to be the primary seamlessly and will handle the database operations. Automated backups, enabled by default, of the database provides point-in-time recovery for the database instance. RDS will back up your database and transaction logs and store both for a user-specified retention period. In addition to the automated backups, manual RDS backups can also be performed which are retained until explicitly deleted. Backups help recover from higher-level faults such as unintentional data modification, either by operator error or by bugs in the application. S3 is a great storage solution for somewhat static or slow-changing objects, such as images, videos, and other static media. S3 also supports edge caching and streaming of these assets by interacting with the Amazon CloudFront service. If the number of messages in a queue starts to grow or if the average time to process a message becomes too high, workers can be scaled upwards by simply adding additional EC2 instances. Amazon Route 53 is a highly available and scalable DNS web service. Queries for the domain are automatically routed to the nearest DNS server and thus are answered with the best possible performance. Route 53 resolves requests for your domain name (for example, www.example.com) to your Elastic Load Balancer, as well as your zone apex record (example.com). CloudFront can be used to deliver website, including dynamic, static and streaming content using a global network of edge locations. Requests for your content are automatically routed to the nearest edge location, so content is delivered with the best possible performance. CloudFront also works seamlessly with any non-AWS origin server, which stores the original, definitive versions of your files. 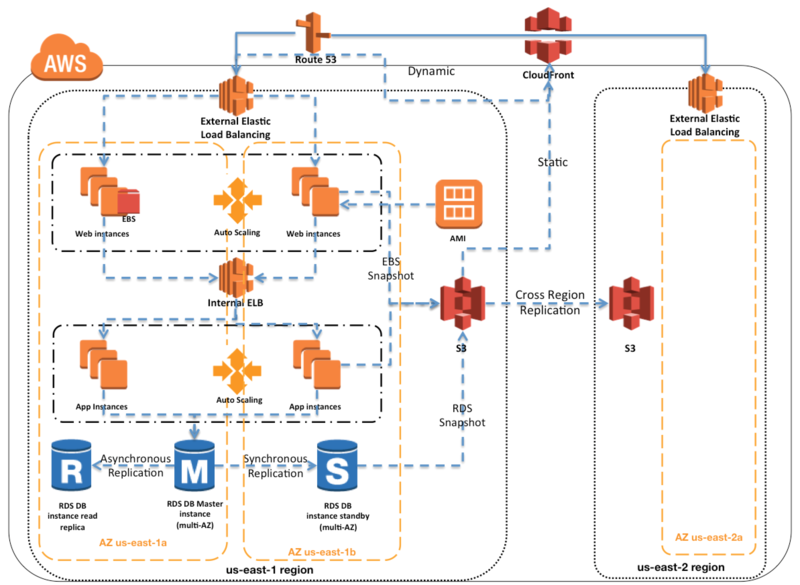 Migrate the local database into multi-AWS RDS database. Place master node into a multi-AZ auto-scaling group with a minimum of one and maximum of one with health checks. Configure a CloudFront distribution and configure the origin to point to the private IP addresses of your Web servers. Configure a Route53 CNAME record to your CloudFront distribution. Place all your web servers behind ELB. Configure a Route53 CNAME to point to the ELB DNS name. Assign EIPs to all web servers. Configure a Route53 record set with all EIPs. With health checks and DNS failover. A web tier deployed across 2 AZs with 3 EC2 (Elastic Compute Cloud) instances in each AZ inside an Auto Scaling Group behind an ELB (elastic load balancer), and an application tier deployed across 2 AZs with 3 EC2 instances in each AZ inside an Auto Scaling Group behind an ELB. and one RDS (Relational Database Service) instance deployed with read replicas in the other AZ. A web tier deployed across 3 AZs with 2 EC2 (Elastic Compute Cloud) instances in each AZ inside an Auto Scaling Group behind an ELB (elastic load balancer) and an application tier deployed across 3 AZs with 2 EC2 instances in each AZ inside an Auto Scaling Group behind an ELB and one RDS (Relational Database Service) Instance deployed with read replicas in the two other AZs. A web tier deployed across 2 AZs with 3 EC2 (Elastic Compute Cloud) instances in each AZ inside an Auto Scaling Group behind an ELB (elastic load balancer) and an application tier deployed across 2 AZs with 3 EC2 instances m each AZ inside an Auto Scaling Group behind an ELS and a Multi-AZ RDS (Relational Database Service) deployment. A web tier deployed across 3 AZs with 2 EC2 (Elastic Compute Cloud) instances in each AZ Inside an Auto Scaling Group behind an ELB (elastic load balancer). And an application tier deployed across 3 AZs with 2 EC2 instances in each AZ inside an Auto Scaling Group behind an ELB. And a Multi-AZ RDS (Relational Database services) deployment. A web tier deployed across 2 AZs with 3 EC2 (Elastic Compute Cloud) instances in each A2 inside an Auto Scaling Group behind an ELB (elastic load balancer) and an application tier deployed across 2 AZs with 3 EC2 instances in each AZ inside an Auto Scaling Group behind an ELB and a Multi-AZ RDS (Relational Database Service) deployment. A web tier deployed across 2 AZs with 3 EC2 (Elastic Compute Cloud) instances in each AZ inside an Auto Scaling Group behind an ELB (elastic load balancer) and an application tier deployed across 2 AZs with 6 EC2 instances in each AZ inside an Auto Scaling Group behind an ELB and one RDS (Relational Database Service) Instance deployed with read replicas in the other AZs. A web tier deployed across 1 AZs with 6 EC2 (Elastic Compute Cloud) instances in each AZ Inside an Auto Scaling Group behind an ELB (elastic load balancer). And an application tier deployed in the same AZs with 6 EC2 instances inside an Auto scaling group behind an ELB and a Multi-AZ RDS (Relational Database services) deployment, with 6 stopped web tier EC2 instances and 6 stopped application tier EC2 instances all in the other AZ ready to be started if any of the running instances in the first AZ fails. You are designing a system which needs, at minimum, 8 m4.large instances operating to service traffic. When designing a system for high availability in the us-east-1 region, which has 6 Availability Zones, you company needs to be able to handle death of a full availability zone. How should you distribute the servers, to save as much cost as possible, assuming all of the EC2 nodes are properly linked to an ELB? Your VPC account can utilize us-east-1’s AZ’s a through f, inclusive. 3 servers in each of AZ’s a through d, inclusive. 8 servers in each of AZ’s a and b. 4 servers in each of AZ’s a through c, inclusive. You are putting together a WordPress site for a local charity and you are using a combination of Route53, Elastic Load Balancers, EC2 & RDS. 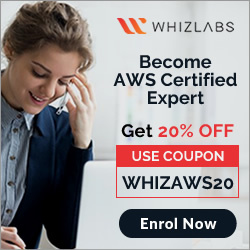 You launch your EC2 instance, download WordPress and setup the configuration files connection string so that it can communicate to RDS. When you browse to your URL however, nothing happens. Which of the following could NOT be the cause of this. You have forgotten to open port 80/443 on your security group in which the EC2 instance is placed. Your elastic load balancer has a health check, which is checking a webpage that does not exist; therefore your EC2 instance is not in service. Hello Sir, Thank you for putting all of this together. I wanted to humbly submit a correction for question #4 on this page. One cannot add an “A record” to Route 53 that points to the ELB because the ELB does not have an IP address, only a DNS endpoint. The “A record” requires an IP address if I am not mistaken. The first option is not correct as there is no such thing as “Amazon 53 bucket”. Therefore the correct answer is the second option which correctly uses an ALIAS record to point to the ELB and does not mention anything that does not exist. I have been wrong in life more times than I have been right. This may be no different so I am open to correction myself. However, I believe I am correct in this instance. Thank you again for this outstanding resource. Thanks Luis, you might be right but i would still stick with D.
With B the RDS is in different region which would impact performance heavily, which is one of the main question point. Also, agreed that a A record does not point to ELB directly, however you do create a A record and just add an alias internally pointing to ELB, which is open to question in option D.
I missed the different region detail. Jayendra, Did you change the question ordering? Question #4 seems to be different. Harsh, did not change the order, just corrected the typos. Regarding Q4, I believe the answer is A. It should also be noted that you cannot launch a Multi-AZ RDS Instance into a specific AZ. Yup you are correct, I liked the option D which is very close to the implementation except to the fact that it does not create a Alias record. Also agreed to the Multi AZ RDS instance into a specific AZ. In Route53 you create DNS Record Type as A record and then select Alias Yes for the ELB. So technically you create A record for ELB. So I think D is the right answer for Q4 as it is the most efficient. Have a look at the documentation here – https://docs.aws.amazon.com/Route53/latest/DeveloperGuide/routing-to-elb-load-balancer.html Additionally, asks for the “most efficient” way. Seems like D is the best option to me. I think D should be the best option. Read line Create Route 53 and point to ELB ……NOT S3 endpoint . Option A is wrong, Option D the Route 53 does not create an Alias record hence it would not work. Option B is the only valid option that would work even though the RDS instance is in different Region. With Option B, if an AZ fails there is not enough servers left to support this part of the requirement therefore it is incorrect. As Autoscaling provide fault tolerance ,as soon 2nd AZ down ,autoscaling initiate another 3 instances in first AZ. What you are talking about there is *high availability*. The application is still available even with the failure of an AZ. Fault tolerance is *no impact to the application despite the loss of an AZ*. In answer A, your site, which requires 6 servers in web tier and 6 servers in the backend tier minimum, as soon as you lose an AZ your application does not satisfy minimum requirements, and you need to take 3-5-10 minutes to spin up the necessary instances to bring yourself back up to capacity. In answer B, you can lose a whole AZ without any impact. Now it should be up to 14 days, but by default 4 days. Thanks Dave, have updated the same. You mention for RDS read replicas they are used for scalability, not high availability. This might be true fundamentally, but if your primary DB fails, you can promote the read replica accordingly. Of course you should always turn on multi-az anyway. But as far as exam details go, what are your thoughts? Read Replicas are mostly projected as scalability solution, cause for HA there is Multi-AZ deployments. But agreed, Read Replicas can act as HA as you can promote a Read Replica to master if the DB fails. However, you would need to take into account the RTO and RPO as Read replicas are not synchronized. Read Replicas surely work for DR across Regions, as Multi-AZ deployments are not possible across regions. Q9, why is port 22 relevant? Shouldn’t A be the answer? Questions checks which option is NOT relevant and hence D as 22 is completely irrelevant. Excellent work and service to all AWS compatriots. Your site is very helpful. I would recommend to segregate the questions and answers/explanations separately (in links), since it blocks the individual thinking process. Thanks Murali, working on the feedback already … checking for options ..
Q8 dynamo db multi region should be changed now ..
thats right Prachi, Global tables are now available in AWS DynamoDB. Hi Jayendra, I have a query. You mentioned RDS Read Replicas is a scalability and not a High Availability solution however Amazon says Read replicas can also be promoted when needed to become standalone DB instances. So does it not qualify for high availability feature? Its not an automated option, so usually if you are given a choice, stick to Multi-AZ is for HA and Read Replicas for scaling.